Are we there yet? The four words that no parent wants to hear when travelling with the kids. And we all know how incessant and infuriating kids can get when bored. So it’s up to you to prepare for every road trip. Ensure that you have got road entertainment covered so that they even don’t notice when you finally reach your destination. And what better way to cover this than with a portable DVD player. Sure we have tablets and laptops now, but you can never fully trust your little ones with your iPad or laptop which leaves the portable DVD players as the next big thing. They are light, have a commendable picture quality and most of them now support USB disks and memory cards. Additionally, you don’t have to worry about the children’s unnecessary exposure to the internet. You are always sure what they are watching. And this does not by any means imply that the portable DVD players are only for kids. There are numerous ways they can come in handy for you. For instance, while at the airport as you wait to board or during the flight. Or if you are a long distance truck driver. They are the perfect way to chase the boredom during those long nights. The DBPOWER portable player is my top pick and for various reasons. First off, it comes packed with a 2,500 mAh rechargeable lithium battery that gives you about 4 hours of playtime. That is enough time to watch two complete movies and still listen to some music after that. Well, unless you are watching a Bollywood movie. And the good thing is that you can charge it with the car adapter in case it dies on you while traveling. Another good thing about this player is its compatibility with numerous multimedia. These include CD, DVD, VCD, and SVCD. It also supports the new type of rewritable CDs and DVDs. Unfortunately, it will not play Blu-ray DVDs. Other supported media include USB and SD cards that you can use to play MP3/WMA/WAV audio files, JPEG images, and MPEG2/AVI/DIVX video file formats. For the perfect viewing angle, you can swivel the screen through 270 degrees. For car use, you can also rotate the screen by 180 degrees which allows you to attach it to the headrest for more comfortable viewing. The av port is a welcome addition that allows you to connect the DVD player to your home screen. Even better you can use the port to link your player to an additional portable player. You will also like the break-point memory function that allows you to continue watching from where you left off. The sound is decent enough, but you still have the option to connect it to an external speaker using an auxiliary cable. If it’s something to ease off your kids during road trips you want, then I highly recommend this player. 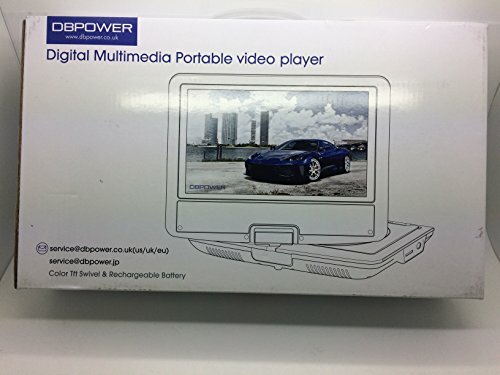 DBPOWER is a big name in the manufacture of portable DVD players as evidenced by the number of positive reviews I came across. They also have a great customer care that will respond to any issue you might have fast and effectively. Measuring a whopping 15.6 inch, the Sylvania portable DVD player is about the same size as the biggest Macbook pro. It would be absurd to compare their picture quality but compared to its competition Sylvania has an impressive resolution (1280×800). The sound from the two stereo speakers is also great and will still be audible even in a noisy street. Moreover, the Sylvania has included earbuds in the package. Also included in the box is a home and car power adapter and a remote control that eases how you interact with your player. The screen can be swiveled through 270 degrees for more flexible viewing, and you can also fold it until it is completely flat like a tablet. Apart from DVDs, you can also watch media from USB flash disks and memory cards. This player is compatible with several media formats including VOB, MPEG1/2/3, and DIVX. Another impressive feature is the anti-shock playback that avoids video stuttering when driving on bumpy terrain. It also supports break-point memory, but you will have to enable this function as the default setting is off. The built-in rechargeable battery provides you with about 2 ½ hours of use on a full charge, but you can extend this to about 3 hours by reducing the volume and brightness level. Sylvania is a big-sized portable DVD player with an even better picture quality. Putting these into consideration, I would say that this is a reasonably priced player that will give you value for your money. This DVD player may have the least screen size (9.5 inches) in our list, but it has no shortage of features to make it awesome. To start, the 2500 mAh can go up to 5 hours without the need to recharge. And when it does finally run out, you can charge it at home with the AC power adapter or in your car through the cigarette lighter plug. Another great feature and also my favorite is the inclusion of a portable game controller and a game disk with 180 classic games. They may not be the new age games but trust me. Your kid will love them. Don’t be surprised when you find yourself hooked too. 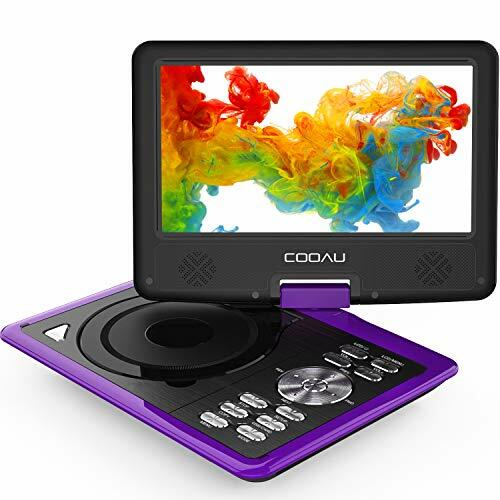 COOAU has an average size so you experience great viewing and at the same time, it’s not too bulky. The addition of a game CD is also a great feature that distinguishes it from the competition and gives your kid another reason to smile. 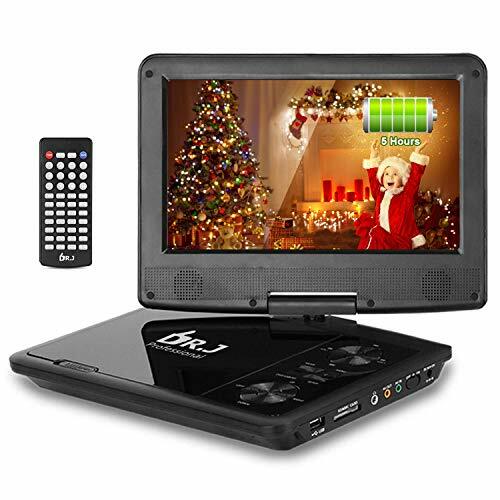 J is another portable DVD player with excellent battery life. It leads me to conclude that the smaller the screen size, the longer the battery life. 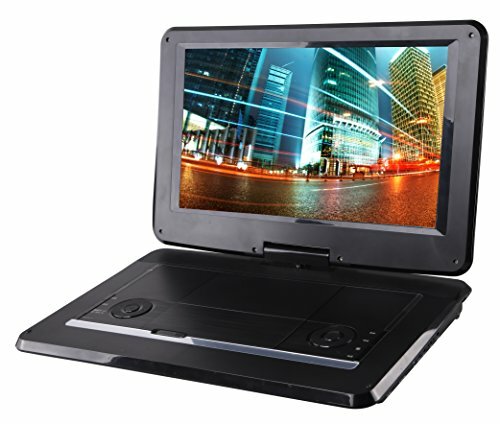 The DR. J portable DVD player comes with a 3000 mAh battery that can run for 5 hours when fully charged. It comes with an AC adapter and a 5.9 ft car charger which means you can charge the player while still in use at the backseat. The 270-degree swivel and 180-degree flip function guarantee you a great viewing experience regardless of where you are sitting. It also allows you to strap the player to your car headrest easily. This player is compatible with a wide array of multimedia ranging from CD, DVD, VCD to SVCD. You can also attach a USB drive or SD card to play MP3/WMA/WAV audio files, MPEG2/AVI/DIVX videos, and JPEG images. Additionally, the DR. J player includes AV in and AV out ports that you can use to either connect it to a TV screen or link it to another player for joint viewing. It also includes an audio jack to connect it to your headphones or external speaker. The break-point memory function allows you to pick up from where you left in the previous session. This DVD player may not have a very big screen but it does not disappoint. Its biggest highlight is the battery life without a doubt. 5 hours is a lot of juice that can be crucial like say if there is a power outage. 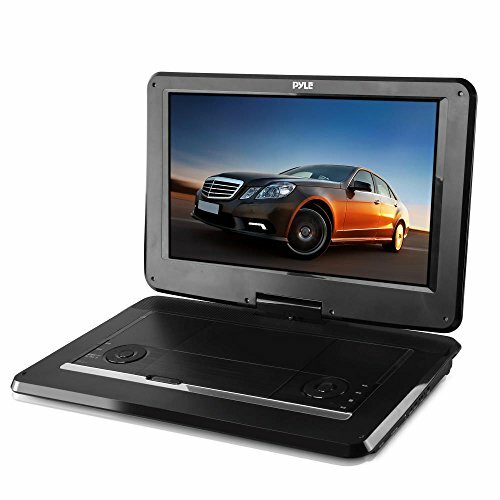 Pyle is another compact, lightweight DVD player that will be perfect for road trips and even flying. It gives about 2 ½ hours of continuous use when fully charged. You will be able to play all your CDS and DVDs and other video audio and image files from your computer’s media library. Pyle has even gone the extra mile to provide you with a USB flash disk and an SD memory card. The LCD screen can be conveniently swiveled through 270 degrees and folded through 180 degrees to match your viewing preference. With a screen resolution of 1366×768 Pixels, we can agree that the picture quality on this player is impressive. This is made better by the inclusion of 2 full range stereo speakers to complete your media entertainment experience. Alternatively, you can connect headphones to the audio jack for a more immersive listening experience. Some of the accessories that come with this player include a car charger, AC adapter and a remote control that enables you to operate the player from a distance. Another feature that you are bound to love is the anti-shock playback that helps you avoid skips while playing your files. If you find yourself straining to watch the smaller screen sizes then Pyle is for you. 15 inches is the size of an average laptop and you are guaranteed a great view regardless of how far you are from the player. It’s also relatively light considering its size.